URGENT: FIAT Chrysler has issued a recall for over 1,000,000 vehicles. 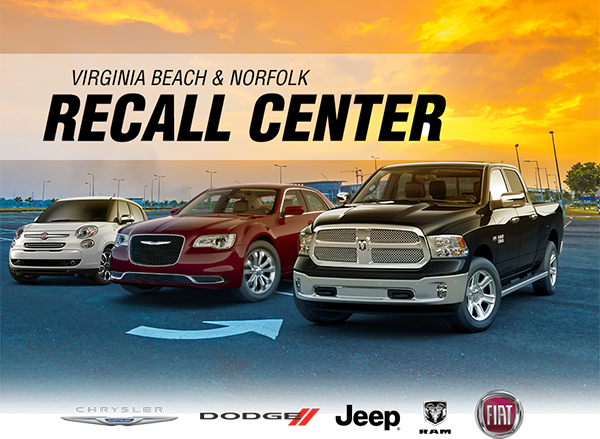 Southern Dodge Chrysler Jeep RAM Norfolk of Airport has been designated as your official manufacturer Recall Center for the Virginia Beach and Norfolk areas in Virginia. As an owner of a Chrysler, Dodge, Jeep RAM or FIAT vehicle, it is vitally important that you contact us IMMEDIATELY as issues relating to your current vehicle's safety as well as certain driving function may be involved! We can provide you with a current list of recall information. Should your vehicle be involved in any recall, we are also authorized to perform any needed modifications to your vehicle ABSOLUTELY FREE. To determine if your vehicle qualifies for repairs at NO COST TO YOU, fill out the form and submit it today.